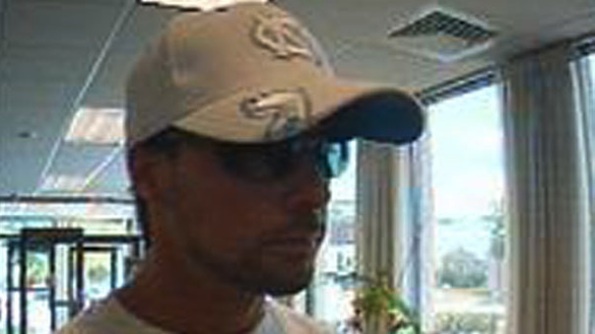 GSB bank surveillance video from Monday, July 23, 2012 bank robbery. Cook County Sheriff’s police responded about 12:09 p.m. Monday to the Glenview State Bank, 2610 Golf Road in unincorporated Cook County near Glenview. Police were able to use video surveillance images of the offender to recognize the offender, and the scent of the offender to track his escape route. The robber left the bank with money, and fled to an apartment complex about a block-and-a-half north of the bank. Melanie the bloodhound tracked the scent to room 205 on the second floor and signaled a positive track with the ‘paws up’ signal indication. The offender wasn’t home, but a man at the apartment said he’s been staying at the room the past few days. The man returned to the apartment later in the afternoon and was recognized by police, who took him into custody. The man’s identity has not been release because charges have yet to be filed. Cook County Sheriff K-9 Melanie and her partner Officer JIm Pacetti in a 2010 video from Cook County Sheriff’s Police Department.